There are endless ways to learn and grow as a professional today–you can listen to a podcast, watch a webinar, or read a blog, but there’s nothing better than some good old fashion face time. So why not attend our influencer marketing learning session and happy hour on Tuesday, June 12th? If happy hour wasn’t enough for you, we’ve boiled it down to three great reasons for you to register to join us, if you haven’t already! During our learning session, Magda Houalla, Head of Campaign Strategy at AspireIQ will discuss the evolution of the influencer marketing industry. 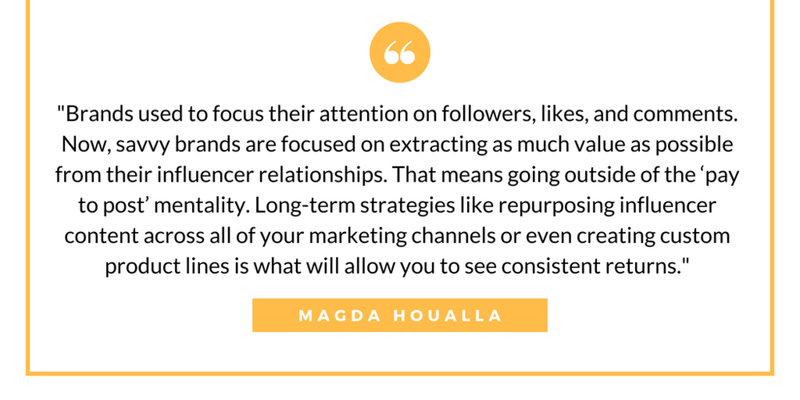 Magda will provide you with actionable steps that you and your team can take to maximize your influencer marketing ROI, now! Take real examples of successful and out of the box campaigns back to your team! Kristin Sword, Marketing Manager at Greats managed to craft and execute an influencer marketing strategy that resulted in the brand’s new line of shoes selling out months ahead of schedule. Want to know exactly how she did it? Get the chance to ask her all of your questions in a live Q&A session! We’ll also review how some of our most successful brands used influencer content across their social, digital, event marketing and PR teams. It can’t be all work with no play! Connect with peers that are working to solve for the same challenges you are. Share your influencer marketing experiences and learn from others. Plus free drinks and hors d'oeuvre make everything better! Ready to join? RSVP here and we’ll save your spot!